Opis: Known for his sense of humor and infectious grin, Charles P. "Pete" Conrad, as commander of the Apollo 12 mission, was the third person to walk on the moon. Not a tall man, Conrad stepped down onto the lunar surface in November of 1969 and gleefully commented, "Whoopie! Man, that may have been a small one for Neil, but that's a long one for me." Born June 2nd, 1930 in Philadelphia, Pennsylvania, he graduated from Princeton University in 1953 and went on to become a Navy test pilot. 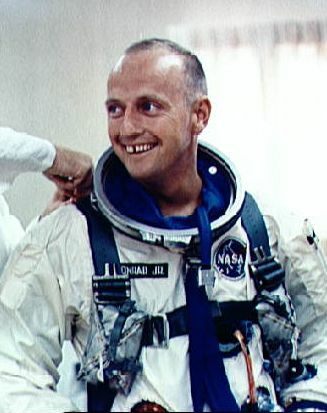 Selected as a NASA astronaut in 1962, Conrad is seen here in 1965 during a suiting up activity in preparation for his first space flight - the endurance record setting Gemini 5 mission. His final space flight was to Skylab in 1973. Tragically, Conrad died from injuries in a motorcycle accident on Thursday, July 8.